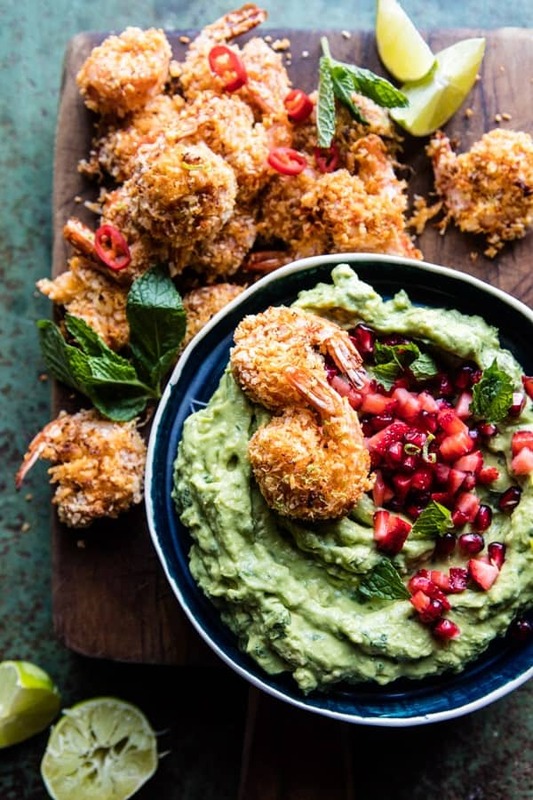 Baked Thai Coconut Shrimp with Lemongrass Guacamole. 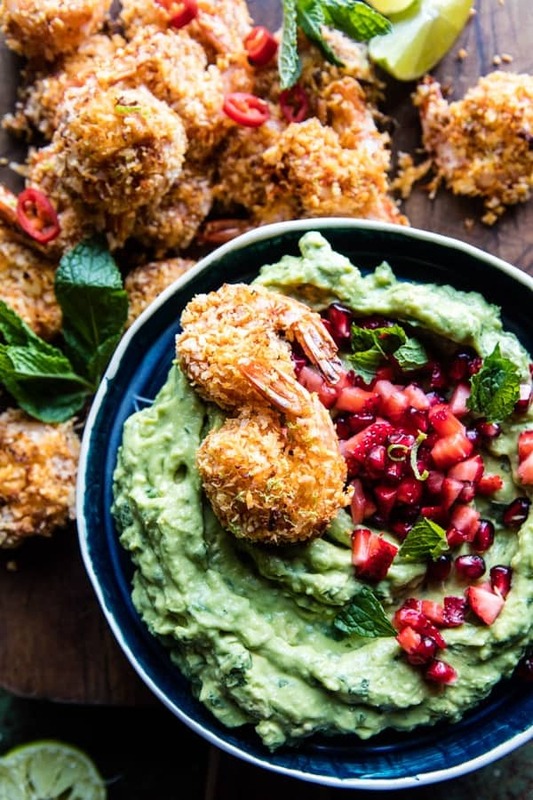 How about some Tuesday snacks in the form of Thai Coconut Shrimp? You guys remember how on Sunday I said I really wanted to get some more appetizer recipes up on the site? Well, this is the first of many, and I’m pretty excited about it! 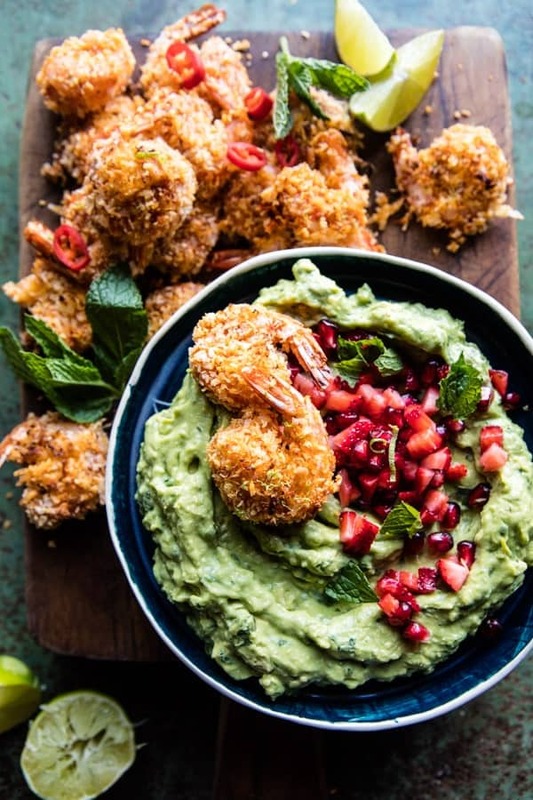 What’s not to love about Thai inspired coconut shrimp and guacamole!? It’s kind of like Thai/Mexican fusion food and it really could not be more delicious. 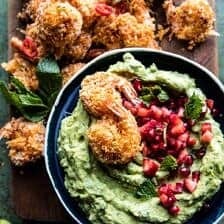 Think about it, Thai flavored shrimp, coated in sweet coconut, and served with a lemongrass guacamole (which on its own is completely addicting). I’m going to be honest, I was little nervous to post this recipe because I feel like it’s kind of different and just a little bit out there. BUT the different recipes are often some of my favorites, so I just had to share! Here’s the deal. 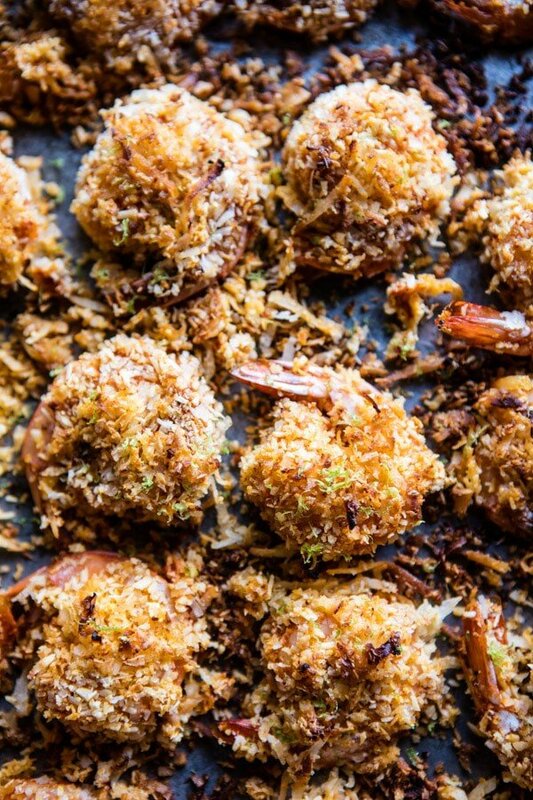 These cute little coconut shrimp bites are embarrassingly easy. Fried shrimp is great and all, but let’s be real, breaking out the oil and dealing with hot oil splashing on my skin is really just not something I want to do on any old day. Not to mention the mess that frying makes…I will do it for doughnuts, but for coconut shrimp, I think baking is truly just as good. So, I baked my shrimp, but before baking, I made sure to flavor it up. Instead of a just a simple coconut breading, we are first tossing the shrimp in a little Thai Red Curry Paste and then dipping it through that sweet coconut. I LOVE this combo so much. Thai red curry paste + coconut + shrimp = the best. The fact that it takes maybe ten minutes or so to bread all the shrimp and then another ten to bake them…well that should make your decision on whether to give these a try a no-brainer. Deliciously different AND fast and easy…yes please! Since you guys know I love a good dipping sauce, I had to come up with something to perfectly compliment the flavors of the shrimp. I went back and forth between a lot of different style dips and sauces, but in the end, the sound of a lemongrass guacamole was just too good to pass up. It’s definitely not your average guacamole, but trust me, it is SO good. I ended up topping the guac with some pomegranate arils and diced strawberries, one because I had them on hand, and two because the sweet flavors really balance out the heat from the Thai chiles. Plus, I’m currently in strawberry obsession mode, I just cannot get enough, so I am adding them to pretty much everything at this point…cough, cough like yesterday’s salad. And now that we are well into spring, with summer just around the corner, I feel as though we should turn Tuesday nights into coconut shrimp night? I mean, these shrimp are so easy, super fun and pretty healthy (hello the shrimp is baked, and hello look at that vat of super colorful guacamole…health food right there). Plus they’re the perfect excuse to make a tropical strawberry hibiscus rum smash (strawberries again…they’re just so good right now). Seems fitting for a Tuesday, right? PS. add a side of rice and maybe some veggies and you’ll have turned your appetizer into a full meal…cool. cool. This Thai inspired shrimp starter is perfect for any occasion! 1. Preheat the oven to 425 degrees F. Lightly grease a baking sheet. 2. Combine the Thai curry paste and fish sauce in a medium bowl. Add the shrimp and toss to evenly coat. 3. Add the eggs to another bowl. Add the coconut and panko to a another bowl, mixing them to combine. 4. Working in an assembly line, dip the shrimp through the egg and then dredge it through the coconut crumbs, pressing gently to adhere. Place on the prepared baking sheet and repeat with the remaining shrimp. Season lightly with salt and pepper. Lightly brush the shrimp with olive oil or cooking spray. Transfer to the oven and bake 10-12 minutes or until the shrimp is lightly golden. Serve warm alongside the guacamole (below). 1. Mash the avocados in a medium bowl. Add the lime juice, lemongrass, basil, and a pinch of salt. Spoon into bowl and top with fresno peppers, pomegranates, and strawberries. Eat! Kicking Tuesday in the butter. All the shrimp and guacamole please. 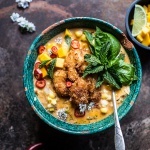 Thai Chile Corn Chowder with Coconut Fried Shrimp. 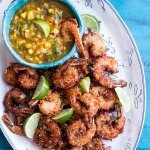 Coconut-Lime Fried Shrimp with Fiery Mango-Peach Jalapeño Sauce. 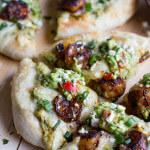 Chipotle Cajun Shrimp and Guacamole Pizza. 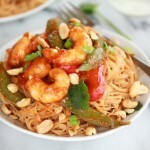 Sweet Thai Shrimp Curry with Peanut Noodles. Love this Tieghan! I’m all for these coconut shrimp… baked thank you very much. Since I started weight watchers I need all the healthy recipes I can get! Love this appetizer! And the fantastic combination of flavor with the lemongrass in the guacamole. I’m looking forward to making it soon. Thanks so much Carlos, I hope you love it! My family would have a fit for this recipe – everybody loves coconut shrimp! I’m with you and avoid frying at any cost – haha. Have a great week! Yes!! It would be perfect for them, hope you guys get to try it Tricia! So funny! I hope you love it next time Lindsay! Those flavors (and colors) are magnificent. I’m a big fan of all things coconut (though I’m the only one in the family that enjoys it, which is a bummer). 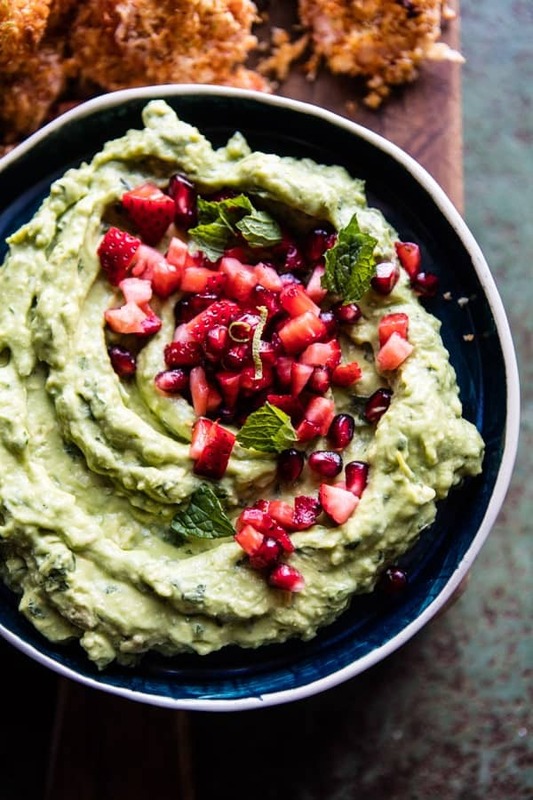 What a great idea to spruce up the guac too! And I’m always into the sweet-spicy combo, so right there with ya. Such a bummer no one else enjoys it! Hopefully you get a chance to try it still! Omg! What?! This sounds like it’s going to be soo addictive! 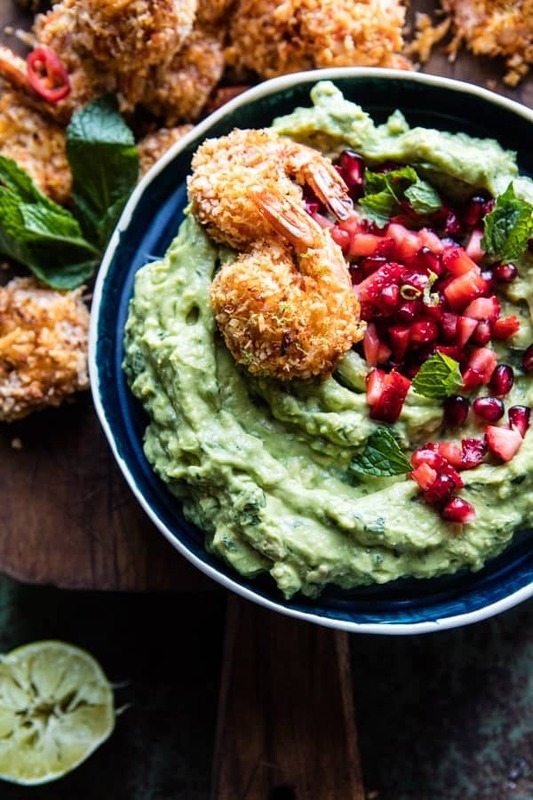 I love how you added a tropical twist to both the shrimp and the guacamole. I seriously need to try this soon! It was addictive!! Thanks so much Andrea! Hope you try it! coconut shrimp used to be one of my favorites growing up! i love that you tossed them in curry paste, too; sounds so flavorful, and a good way to make sure they don’t end up too sweet! Tieghan, this looks sooo delicious! What a great appetizer this is! No frying needed? Yes, please! And strawberries in guacamole is just the best. Girl, these shrimp look out of this world! Yum!! Ah thank you so much Sara! Hi Tieghan! I’ve been wanting to explore more seafood, and am guilty of avoiding it altogether for fear of most tastes being overpowering. I’ve had issues with baking/panko just not turning out as tasty as a fried version- any tricks so that I can do this properly and have a perfect “faux fry” result? Flavors here sound amazing! …And I’m gonna skip over the rice and veggies (forgive me just this once😘) and go right for the chips to make this fantastic appetizer a full meal! Ah so excited your choosing my recipe to explore! I hope you love it Gia! This looks amazing!!! Where is the best place to find lemongrass? I swear I’ve been searching for it for years!! Once I find some, I’m totally planting it in my herb garden! This is literally my dream recipe. Coconut shrimp are the best, these look so good! What a great idea to incorporate the curry paste and fish sauce before breading. I can’t wait to try this! I have been making one or two recipes from your blog every week for awhile and my husband just said tonight, Wow, your cooking has been amazing lately! This looks great! I’m going to a party tomorrow night and this looks like it would be great to bring! Could I take a shortcut and just buy my fav guacamole or do you think not having lemongrass in it would totally ruin the vibe of the recipe? this was so easy and tasty! I do have one question: how do you get the crust to stick better to the shrimp? It kind of just came off when we were eating it. Any advice would be greatly appreciated! Hi! This looks delicious! Do you think it would be possible to use cauliflower in place of shrimp and get the same crispy results? Thank you!